Dolls. I have so many stories. I still have my first dolls, hand-made, two-foot-tall cotton ladies with the most lovely dresses, whom I named Dorfy and Cinnamon-Rose. Dorfy, being the biggest and strongest of my dolls, eventually sat under the growing pile of her little charges, and kept them safe while I was away from the house. Cinnamon-Rose eventually went to my younger brother, who renamed her Friend. Paulus, the baby-doll which my mother apparently bought at a discount because he'd been accidentally stained with permanent marker in the store, was my favourite. He slept with me every night, and travelled with me to visit my Dad until I was a teenager. This is a secret I kept safely hidden until some other teens discovered him in my bag and pulled his head off. In one of multiple such emergency surgeries, my mother sewed it back on. It never mattered to me that he had a line on his back, or that his neck had a bit of hard plastic and a stitch-line around it. Didn't matter that his cheek was scraped by a bit of too-abrasive scrubbing on my part, or his toe chewed off by my beloved dog. He was my baby. My Dad owned a toy store for most of his life, and through him I learned quite a bit about what he considered "wholesome dolls". He never sold Barbies, American Girl Dolls, He-Man or Cabbage Patch Kids, but instead stuck close to Waldorf and other more "playable" baby dolls. He explained that "playable" meant children could connect with the dolls on their own level, with their own emotions, and their own narrative. 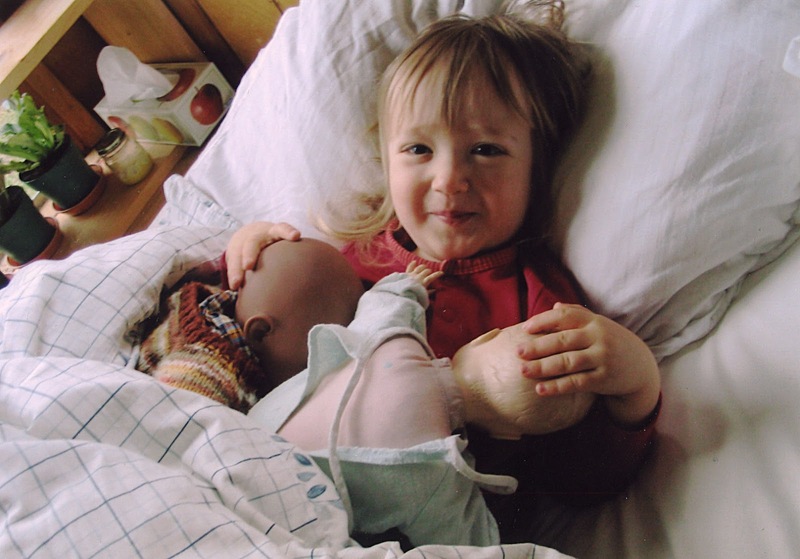 Dolls shouldn't come with a pre-ordained backstory or emotions; they should have a neutral personality, so that they can assume the roles dictated by children's imaginative play. Children's imaginative play is not always nurturing, as I learned from my friends who dismembered their Barbies and incinerated G.I. Joe dolls. And it wasn't until I had my own children that I discovered how important children's experience of dolls can be. I bought my son his first doll when he was almost two, and I was soon-to-be pregnant with his sister. I took him to the department store baby-doll section, and said he could have a look and tell me if he liked any of them. He considered a very cheaply-made Cherokee collector doll, until his eyes landed on a lovely little black baby doll, with which he was smitten. "OK", I said, wanting to be sure he was certain of his choice, "let's check out another store and we'll come back if this is still your favourite". He perused the babies in the next store disinterestedly, until he once again discovered the same little black baby doll, and begged me to buy it for him. Well of course I did! His choice was clear. He named his baby Aslakay - also something he was unwaveringly certain of, although to this day I have no idea how he came up with it. Other dolls came and went, but Aslakay was the only doll he ever really loved. He changed him and nursed him, told him very exciting stories, taught him to play trucks and to roller-blade and to dance ballet, took him for wonderful backyard adventures, and fathered him very carefully. It was alarming, to be sure, but those girls' play was allowing them to work out their questions in the world, to see themselves as caregivers and to question their own experiences, development, and opinions. Because dolls are people. And a human's constant work is learning to engage with and understand other people. That's the thing we have to remember about dolls: As humans we are drawn to engage with other humans, and dolls represent humans. Vincent Reid recently proved that the human fetus preferentially engages with face-like visual stimuli. That's right: in the womb - even before we are conditioned to receive love and nourishment from humans with faces - we already seek to engage with them. Humans have been making tiny humans for our children for millennia. We see faces and bipedal figures in everything from pancakes to tree-trunks to constellations. We want to look at other humans, and we want to bond with them. 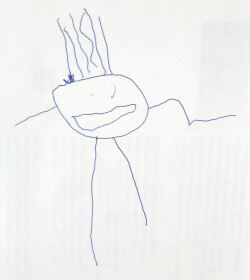 Children's early figurative drawings often look like big faces with arms and legs. "... the individual personality of each of these figures, as evidenced by his biographical file cards and physical characteristics inviting "intimate and manipulative" play, 703 F.Supp. at 946, indicates that these figures are not comparable to the identical, immobile faceless toy soldiers of yesteryear that were sold in groups of a dozen or so in bags." While I don't like soldier-dolls, I can see that for some children they would be appealing. Just like my daughter and her friends were exploring ideas of domestic crises in their Dollhouse Baby Circus, children need to deal with experiences of war. We have a choice of how we facilitate those sorts of engagement. 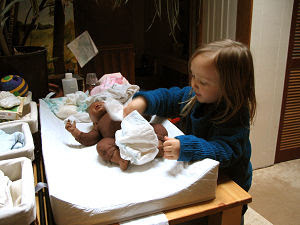 Dolls not only allow our children to explore and work through their own experiences with dramatic play; but the sorts of dolls we choose for them can influence the way they deal with those experiences. As soon as my son could speak in partial sentences, he began telling us about his life as an "old man" before he "died", "lying on the side of a road", as he claims to remember. He talked about what we now think is somewhere around Lake Chad, where he was "a man with brown skin and black hair". At first these stories seemed absurd, then terrifyingly plausible, as he detailed a life that, when I Googled, became a perfect description of a place and time he had never experienced in the two years since he exited my womb. So I decided to just believe him - whether the stories are his own memories or some sort of quantum memory-exchange I'll never know, but it was my job to just listen and respect. For years, he talked lovingly about the house he and his wife lived in; how she made mats out of big grasses and he put those on the house for walls; how they had a fence to keep crocodiles out. And he told us that the soldiers came to his island with sticks and killed his wife and everybody else in his town. He escaped on a boat with his daughter Imapa, and he missed her very much. He talked about Imapa most of all. Having no experiences like those he shared with me, I was of little help to him in his quest for connection about these memories. Is it any wonder, then, that the doll he chose in the department store was the only baby doll with brown skin? He needed to play out his memories; he needed another opportunity to love the child he lost. Or so I imagine, and it doesn't matter whether I'm correct, or not. Aslakay is a brown doll with a cloth body and plastic feet, hands and head. His body has been stained from the baby-wipe and washcloth cleanings performed by his two-year-old father. He's not the fanciest doll; not made with the kind of love that is tangible in some of the handmade dolls. But he's real. His face is the face of love that my tiny son needed in his life, and that is what matters. When my daughter's dearest baby, Mimi, was lost on an outing with her plastic cousins, my daughter grieved. She grieved for over a year, losing interest in her other babies, and crying inconsolably at night. This event gradually led her and her friends to grow into other forms of play: board-games, theatre, art-making and magazine production, and an increasing amount of teenager conversation that is frankly as mysterious to me now as it was when I was a teen. But even without dolls, the bonds these children formed over their babies are still tight. If you were hoping for a list of recommended dolls, you're not going to find one, here. I can only suggest that, if you're considering buying a doll for a child, it would be nice if the child can be involved in the choice. The doll your child needs will be as unique as your child, and as loved. The doll you give your child will represent his past and his future; his loved ones and himself, and only he can know what doll that is. It will be treated the way your child is treated by those in his family and community, and it will be the face of his dreams and fears and joys and sorrows. "The doll is symbolic homunculi, little life. It is the symbol of what lies buried in humans that is numinous. It is a small and glowing facsimile of the original Self. Superficially, it is just a doll. But inversely, it represents a little piece of soul that carries all the knowledge of the larger Soul-Self. In the doll is the voice, in diminutive, of old La Que Sabe, The One Who Knows. In this way the doll represents the inner spirit of us as women; the voice of inner reason, inner knowing and inner consciousness." Are Homeschoolers and Unschoolers Too Attached? Long ago, when my daughter was somewhere in the range of five to eight years old, she came to me during a wilderness outing I was leading and said that a stranger had asked her if she gets tired of always being with her mother. She came to me because the question was absurd to her, and at the time I thought it was absurd, too - especially when asked of such a young child who was happily participating in her mother's program. But that experience has stuck with me over the years, because in some ways it's a valid concern. Homeschoolers are often seen as too-attached, unworldly, homebodies, and inexperienced. Unschoolers are often less so, since the philosophy usually includes giving children a lot of freedom, and exposing them to a wide range of experiences... but we still carry the burden of that stereotype. Some people may shrug it off, but I am one of those parents who is always questioning myself and the many decisions I make in parenting, so I have worried about this often. Am I too close to my children? Today this is on my mind again. Although my kids now attend various programs and events in the city, and leave the house three to five days every week, without me, I am still a stay-at-home parent, trying to develop a career while also managing school and home details. There are a LOT of such details, and I am never caught up. Even when the kids are out for the day, I never seem to get a good day's work in, always distracted by pending meals, telephone contacts, or kids coming home. So this weekend they're away visiting my husband's family for three days in a row... and I'm getting stuff done! In just thirty-six hours, the tally is seven loads of laundry (washed, hung outside, taken down, and folded), taxes and other such awful ordeals completed and filed, various messes tidied, three enormous stacks of papers sorted and filed, a nice little garden visit with my Mum, a good night's sleep... and this blog post. This gives me a hint at what I might accomplish if I wasn't so involved with my kids, and I admit to longing for a little more of it. At a recent festival goofing off with their Pappa. Photo by Linda Wilke. So why are we still unschooling? Here's the thing. Being a stay-at-home parent and unschooling are choices I made with my partner that I don't regret. There are trade-offs, and one of those is my own independence and time for a career. My kids are twelve and fifteen. They help around the house, make more than half of their own meals, get themselves where they're going without demanding rides, and generally only need my engagement to help them manage their growing and changing lives, and to share their many wonderful activities. They share with me because they want to, and I am enormously grateful to still have this connection. They still snuggle me every day - even if we've been fighting. They still share with me their deepest longings and fears, whether through late-night whispers or quiet hints dropped in innocuous-seeming creative writing sent to my inbox. They still trust me and want to be with me, and that allows me to sleep at night, trusting that they are safe, and that when trouble comes their way, they'll be able to come to me. How many years do I have left of this chaotic, manic bliss? Five? Maybe? I'll take it! Please Help Me: An open letter to doctors who help and hinder. Well holy that was an epic day! So epic that I'm going to share this story as a totally crazy yet serious tale of how our medical system sometimes fails us, and how it also sometimes saves us. As background to this story, you need to know that my son suffered what we and his doctor assume to be a vaccine injury at nine months of age (his third tetanus/diptheria/pertussis and second MMR vaccine), and has suffered nearly fifteen years of inflammatory reactions to food, and a frustrating inability to gain weight as a result. (Details in a separate post here.) We have a wonderful doctor who is on board with our decision to stop vaccinating after this occurred, and while unable to find any solutions, has at least been kind and thoughtful, helping us to discover some coping strategies along the way. Unfortunately, our doctor wasn't in, today, when I took my fifteen year old son in to consult after he stepped on a nail. For obvious reasons, I was worried about tetanus, but also worried about another possible vaccine reaction, should we choose to give him a tetanus booster. And here is where my crazy story begins. The doctor we saw was highly reactive as soon as I mentioned my concern about the vaccine. I hadn't yet managed to tell him my son's history, because he cut me off, and said "Well if you don't want my advice, why do you come in?" This is the third time I've heard that particular bit of arrogance from a doctor, and I want to bring it up here, because it's SO harmful. I felt crushed, and said quite honestly, "The reason I am here is because I DO want your advice. I'm worried about my..." He cut me off again. In fact he cut me off a whole bunch of times, until finally I told him that I was having difficulty explaining our situation because he kept cutting me off. I was near tears by this point, with the frustration of this and all the other times a doctor hadn't listened, bursting in my heart at once. So when he stopped talking, I took a breath, and told him very clearly, my voice breaking, that my son had had a reaction to his early vaccines, so we were concerned about repeating one of them, and that I was there seeking his advice on how to manage this situation. He chuckled and waved his hand at me, and said "I don't know why you're behaving like this" - by 'like this' I assume he meant verging on tears, since other than that I was sitting calmly trying to explain our situation. I told him "this is my child, and I'm worried for him". He then proceeded to question whether my son had indeed ever been vaccinated, since he didn't have the records, or if we'd even been at that practice very long, until he realized that he was just looking in the wrong place. When he finally found the records and my story was corroborated by our own doctor's notes, he simply referred us for the tetanus antibody blood test I had requested, and also for an immune globulin shot, and a tetanus shot. I left his office with my son, and got in the car. I felt broken. Just broken. I felt unheard, and unhelped, and uncared for. But because I had my beautiful child limping into the other side of the car, I collected myself up and said we'd go get some tasty lunch at the grocery store before going for the blood test. Remember how his vaccine reaction caused serious food intolerances? He can't eat gluten, soy, eggs, or beans. Not too bad, except that gluten and soy are dumped liberally everywhere. There are few options other than fruits and veggies that we can buy, but I wanted to get him a treat, after that doctor ordeal. The grocery store didn't have the one type of bread he can eat. So I checked out sushi: all of it contained "soybean spread" - whatever that is. So I asked about the homecut fries in the deli department. I know they come from a bag. "Could you tell me the ingredients", I asked her. She looked at me like I was crazy, so I repeated, "could you please tell me the ingredients in the fries?" "Well, yes. But I wonder what's on them. It will say on the packaging." "Probably spices, for sure." She said. "Yes, I'm sure. But could you check the packaging for the specifics?" She rolled her eyes and said, "What - you have allergies?" "Don't buy it," she said, and she turned away. I bought some popcorn, cheese, and a soy-free chocolate bar and returned to the car, deflated again. So off we went for a quick and nearly-painless blood-test, and then I parked the car in a two-hour spot and began my search for a doctor who might discuss some possible solutions for our dilemma. I phoned or walked into four offices, and in each was met with the same thing: We have vaccines on site. We won't discuss another option. Finally I managed to get an appointment for later in the day with a doctor I knew nothing about, but at least I hadn't already been turned away by his receptionist. So I went back to the car, to tell my boy we'd have an hour to wait until the next appointment. He looked a little nervous, and said, "but you can't drive. You got this ticket. You didn't renew the insurance. A policeman came by and you can't drive anywhere." CRAP! So not only did we forget to renew, but the car and insurance are in my husband's name, and he was on the island. This is when my day turned around. I asked a nearby bank employee who helpfully found me the closest insurance office. I walked a few blocks to that insurance office, and explained my dilemma. I called home to the island but my husband had recently left the house. I phoned my brother, who then drove to the building centre to find my phone-free husband and have him call the insurance office. Then the insurance broker in the city wrangled the ICBC workings with the broker on the island, and between the two of them, they resolved the issue. Except the printer wasn't working, and I was due for that final doctor's appointment. Off I ran to the doctor. He sat down nonchalantly and looked straight at me. He listened to my whole story. It took me at least a minute to describe my son's situation, but he just ... listened. Then he asked some questions, and he listened some more! Then he made some wonderfully helpful suggestions, and also reassured me that while tetanus is a very serious disease, it isn't very common. I had very little time to thank him for his wonderful supportive and helpful manner, because the insurance office was closing imminently, and without my insurance I would have had to leave the car in that two-hour parking spot overnight. Of course... I'd already been parked there for three hours at that point. So I started running. Half way to the insurance office, a woman motioned for me to slow down. It was the insurance broker! She smiled, and said she figured I was definitely over the two-hour parking limit, and thought she would just try to find me with the new insurance papers. She handed them to me and I nearly hugged her. Here's the thing. Vaccines are a wonderful invention. For most people they are, anyway. And it's definitely prudent to do the thing that works for most people. Like you treat your garden in the way that will work for most plants, even though you know you'll lose some along the way. But what if one of those little seedlings came to you and said "hey - I need something slightly different." Maybe you'd call it collateral damage. Or maybe you'd stop and ask it to explain. Please, doctors, listen to your patients. If we are in your office at all, it's because we respect you and hope your knowledge and experience can help us. But you can't help us if you can't even hear what we're asking. We feel so alone when you shut us up. We feel thrown to the gutter. We feel uncared for. If it takes an extra two minutes of each visit to just listen, please do it. Today I had a really terrible day, and it was saved in the end by people who took a moment to really listen to my problem, and help me find a solution, even when it wasn't the same one that everybody else needed. As doctors, you have the opportunity to change and save lives. Whether or not you do depends partly on how well you listen, and demonstrate compassion. It turns out even insurance brokers, bylaw officers, and grocers have the ability to make or break someone's day. All of us do. Can we, please? Last year when my daughter fell and injured her knee, two members of our community, who happened to be passing by and notice her, helped contact us and look after her until I arrived. One of them also took her bike and kept it until we returned from the hospital. My kids live a gloriously free-range life, and we are often glad for the ways they are parented in community. Just the other day they went busking in town by themselves, and when they got home I asked them how it went. They both reported their successes, how much money they made, and compliments they received. And my son told me about the guy who kindly suggested he should increase his accordion repertoire. He has balked many times at the same advice from me, but hearing it from a stranger had a bigger impact, and now he is happily taking that advice. I've noticed him sitting around practicing some tunes in the past couple of days. Coming back from busking with some great successes and some great advice from a stranger. Advice isn't always what I'm hoping to hear, of course. Once when my kids were younger they went to the library - a 2km walk from our home which they did quite regularly at the time - and then phoned me to report that they were not allowed to go home without a parent, because the librarian was worried about them. I spoke to her, and reassured her that they had my permission - then and in future - to hike themselves around the island. I didn't go pick them up, but I was glad for her concern. It's wonderful to know that my children are seen and heard. I've also received a call from a friend, letting me know that my kids were arguing incessantly and disruptively when she met them at the library... once again I was glad to know, and to be able to have a talk with my kids, sort out what was going wrong, and help them resolve it. It can be difficult, when receiving advice or hearing concerns from community members, to take others' words in stride, and not react defensively. I've been told that my kids rudely entered a house without knocking, and didn't say hello to the rest of the family when they arrived, and my defensive reaction meant the end of a very dear friendship. I wish I had reacted differently. Even though I disagreed about the severity of my kids' infraction, it is my place as a parent to recognize that another community-member's advice is almost always well-intended. The way I take that advice will influence the way my children take advice, themselves, so it's very important that I respond maturely and confidently. Of course it's not always nice to hear negative feedback, so we can be gentle in our suggestions, and gentle in the way we receive them. Wherever we go, we are a part of the bigger picture. If you see my kids, I am glad you noticed them - even when they're causing problems. If I see some kids (known to me or not) needing help or causing harm, I will absolutely step in if no parents are around. I don't know what their family rules are; I don't know what's expected of them, so I will ask. And if I'm really concerned I'll try to convey that to them. I'll try to be supportive whether I'm worried for their safety or for the pigeons they're tormenting, because I hope that others will do the same for my kids. That's what community does. As my kids grow older and further out into the world, I am more and more aware of both the risks they face and the help and guidance they receive from others. They are moving out of the circle of my arms and into the wider circle of their community. People trust them and hire them for babysitting, pet-sitting and yard work, and when things go awry, those people support them too. I will never forget the day I accidentally smashed the mirror on the back of the door at the home where I was babysitting - for the second time in two weeks. When the parents came home I was devastated. I cried, and told them I would pay for the mirror. They insisted I take my babysitting fee, they hugged away my tears, and they drove me home without a single word of reprimand, and only support. And they hired me back again. These are the interactions that make us a part of our community - that remind us we are seen and valued, that our actions matter and that we matter. And in the end the vast web of support and connections our children carry is what makes our communities strong safe places to grow, together.